The Call for Storytellers is OPEN for all 2019 BRMConnect Speaking Opportunities! Thank you for your interest in speaking at BRMConnect. In order to help us facilitate your request to be a #BRMLegend Storyteller, please complete and submit the following form. The deadline to submit your proposal is Wednesday, April 30, 2019. If you have any questions please contact us at [email protected]. Please read the following to ensure all expectations are communicated prior to submitting your Storyteller Submission Form. NOTE: Please understand failure to adhere to expectations and deadlines will be deemed as a breach in commitment at any point in the process. If this occurs, your session will be removed from the agenda and replaced accordingly. Provide audio/visual and material requirements by deadline . Each breakout session is 45 minutes in duration. Talking time should be no more than 20 minutes. The remaining time is dedicated to an interactive element (see below). The slide deck cannot exceed 15 slides. Attendance will be based on room capacity (breakouts rooms will hold 80-120 people). We challenge you to use only images to convey your message in your PowerPoint slide deck. We will not be doing any proofreading or grammar editing. Interactive elements foster creativity, networking, and collaboration. Documentation will need to be provided to show how the interactive element will be integrated into the presentation. Agree to use Glossary of Terms for messaging consistency. We will conduct a final pass for consistent messaging only. We encourage the use of a fun theme or pattern to share your information! Attend Mandatory Storyteller Meeting on July 24, 2019. Public conference prep webinar for any/all attendees on September 18, 2019. The first hour of every scheduled conference after-hours event as attendees want to interact with the storytellers. Mandatory Storyteller Meeting the morning of your session (7:15 AM-7: 45 AM). If you agree to comply with all the stated expectations and deadlines, submit your #BRMLegend Storyteller Form, below, by April 30, 2019. Submission confirmation will be sent. The Content Review Committee meets monthly to review submissions. Approval, rejection or clarification status will be sent after the Content Review Committee meeting. Sign the Storyteller Agreement by June 28, 2019. This will be sent from BRM Institute Legal via EchoSign, our electronic signature system. Register for the World BRMConnect Conference by July 31, 2019. 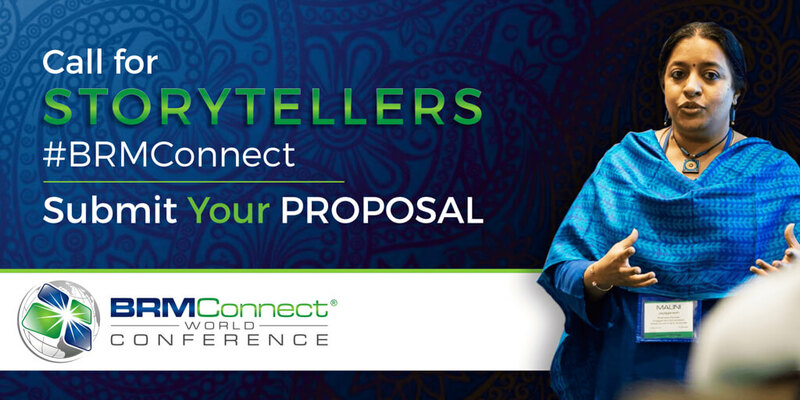 Enter the coupon code provided in your confirmation email to receive the $1,700 discounted storyteller rate. Book your hotel room accommodations by July 31, 2019. Draft Presentation by July 31, 2019. Final Presentation by September 2, 2019. Please write your bio, session title, and session description below as you would like it to be published (if your session is approved). Let us know if you have any social media accounts we can tag you in to promote with your sessions.